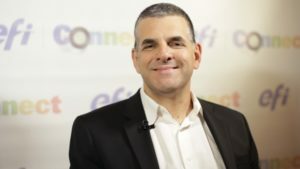 EFI announces that its longtime CEO Guy Gecht has informed the Company’s Board of Directors that he intends to step down from his operating role at the company when his successor is named. The Board retained Spencer Stuart, a leading global executive search firm, to assist in a thorough search process that includes both internal and external candidates. Guy Gecht will continue to serve as CEO until his replacement is named, and has committed to working closely with the new CEO to ensure a successful transition. Guy will remain as a member of the Board of Directors following the CEO change. He takes the decision after 19 years as CEO of EFI. During his tenure as CEO of EFI, Guy together with his team transformed the company from a single product line and OEM business model to a diverse, worldwide leader driving the transition from analog to on-demand digital imaging in industries that touch lives of many every day. He led the expansion into Productivity Software and Industrial Inkjet, which drove EFI’s rapid growth to over $1 billion in annual revenues. Guy is only EFI’s third CEO in its 30-year history, which has brought a unique stability that the Board truly appreciates.